The Local Service Load Balancing module or LSLB module is able to manage TCP, UDP or HTTP[S] protocol, improves application and traffic management availability and scalability between a pool of servers geo-located in any part around the world. Under this section you’ll have the posibility of creating two profiles called HTTP[s] and L4xNAT, mainly TCP/UDP/SCTP/HTTP/HTTPS based apps). Create Farm. Create a new farm managed by the LSLB module, available farm profiles are http, https or l4xnat. Restart. 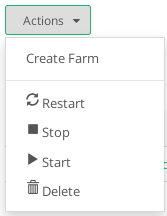 Stop and start again a farm service in the LSLB module, available farm profiles are http, https or l4xnat. Stop. This action stops the selected farms services. Start. This action starts the selected farms services. Delete. This action stops the services and deletes the farms configuration and history connection stats. The actions will be executed in batches in all the selected farms (multiple selection available). Farms listing with the properties of every farm. The fields shown per farm are described below. NAME. Descriptive name for the farm, this value will be unique in all the virtual services created. PROFILE. The configured profile for the given farm, available profiles for LSLB module are: http, https and l4xnat. VIRTUAL IP. IP address that is managing the traffic, it’s also known as the virtual IP that could be moved to another node of the cluster. VIRTUAL PORT. Port that is managing the traffic, it is also now as virtual port. Green: Means UP. Farm is running and all backends are UP or the redirect is configured. When the status is UP the farm is running and is able to manage the traffic in the configured virtual IP and PORT(s). If the status is DOWN the farm is stopped and the incoming connections rejected. If the status is RESTART NEEDED the farm has changes but still not applied, a restart is required to apply the new changes. Edit. Change the basic and advanced options for this virtual service or farm, create new services and apply changes to the backends. Restart. The Farm will be stopped and started automatically. Stop. This action is only available if the farm is running and all the traffic managed by this farm will be dropped once the button is pressed. The PORT will be released so, it will be able to be used by another profile. Start. 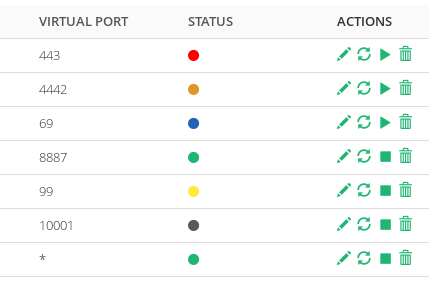 This action is only available if the farm is stopped, the service will bind to the configured IP and PORT and hence the traffic through them will be handled by the farm. Delete. The Farm will be stopped and all the configuration files deleted. The IP and PORT will be released so it could be used by another farm. Next step, create a LSLB farm.